The First Interpreter in the New World. As interpreters and translators we know that every job we do is very important and some of it will even transcend. Today I want to focus on the pioneer of our profession in the Americas. 491 years ago, on a day like today: August 13, 1521 the Spaniards finally defeated the Aztec Empire and conquered Tenochtitlan where they founded what we know now as Mexico City. At first glance, it seems that this incredible feat was accomplished by a handful of conquistadors and a fearful Aztec emperor who considered them gods. Modern research has discarded that version of history as we now know that it was a more complex succession of events that led to the fall of the most powerful nation west of the Atlantic Ocean. A big part of the outcome, if not the most important part, was brought about by a native woman of a lower-noble family from the Aztec Empire frontier, now the Mexican State of Veracruz. Her birth name was Malinalli, the name of one of the 20 days of the Aztec month, but as she grew up, she became known as Malinalli Tenépal. The Náhuatl word Tenépal means “a person who speaks a lot with enthusiasm and fluency.” Sounds familiar? When Spanish conquistador Hernán Cortés arrived in what is now Tabasco México and defeated the Chontal Mayans, she was among the slave women he received as a present. The Spaniards noticed right away that Malinalli, or Marina as the conquistadors named her, spoke the local Chontal Maya language and her birth tongue: Náhuatl, the language spoken by the Aztecs. It became very clear that this girl, probably around 19 years of age, was very sharp, very pretty by all accounts, and had a gift for learning foreign languages. At the beginning, while she learned Spanish, Cortés used her as his Chontal Maya <> Náhuatl interpreter. She worked together with Gerónimo de Aguilar, a Spanish priest Cortés freed from the Mayans after years of captivity and knew Chontal, doing relay interpreting. It wasn’t long before she learned Spanish and Cortés realized how skilled she was, so she became his personal interpreter. Doña Marina, as the Spaniards referred to her, or Malintzin, as the natives called her (“Malin” being a Náhuatl mispronunciation of “Marina” and “-tzin” a reverential suffix for “Doña”) interpreted for Cortés in at least three combinations: Spanish, Náhuatl, and Chontal Maya, and there is reason to believe that she also spoke, or later learned other Mayan dialects as she served as interpreter for Cortés in what is now Honduras. Testimonial and written accounts describe her interpreting consecutively and also doing whisper-interpreting for Cortés during many of the most important meetings with the native lords, including Montezuma, the Aztec emperor. 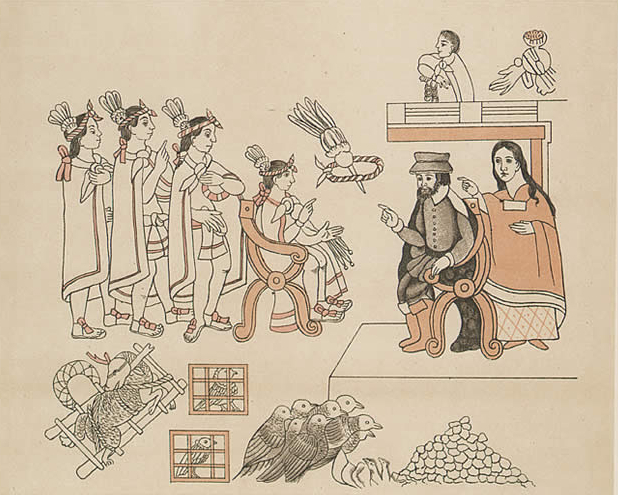 In fact Malinalli’s role went beyond mere interpreting; she was a cultural broker who helped Cortés to successfully establish alliances with natives who were enemies of the Aztecs like the Tlaxcalans. She also taught Aztec culture to Cortés, and even protected him by warning him of an assassination attempt that had been planned while they were staying in Zempoala, the same way modern-day military interpreters are trained to do if they ever find themselves in that situation. Very few interpreters have had the opportunity to be the “first” to do anything, and despite the fact that many Mexicans consider her a “traitor” for helping the Spaniards, on this anniversary of the fall of the Aztec Empire, as interpreters we should remember this pioneer of our profession, salute all the things that she did instinctively right without knowing formal interpretation, and recognize her for her key role in the fusion of two worlds until then apart. She was truly a bridge between two cultures that knew nothing of each other. I would like to hear your comments about Doña Marina and her role in the history of interpretation. § 12 Responses to The First Interpreter in the New World. Geronimo de Aguilar also gets some kudos for his role in instructing Dona Marina SpanishChontal Maya. Another “pioneer” interpreter around the same time, one that brought to light many languages of the territories that eventually bacame Southwest U.S., is Cabeza de Vaca and his two companions. Now that was a seminal “learning” trek. while I applaud your good intention in approaching this subject, I have taken the liberty to insert the comments respectfully reproduced below on the Facebook page maintained by “Interpreting the World” on Facebook, which has just published a link to this web page of yours. She (Malinatzin) came to be known in Mexican history as «La Malinche», and the pejorative adjective «malinchista» has been in use for centuries and to this day to criticize and denigrate any Mexican national who is perceived by his fellow countrymen to prefer a foreing product, custom or culture over his or her own. If AIIC has truly selected this highly controversial figure, considered by the majority of Mexicans to be nothing less than a traitor to his people and to the Mexican Nation, as a symbol of the professionalization of our vocation, then I’m afraid that was a major blunder that deserves to be reviewed and perhaps rectified. Please feel to add USCCI [ret’d] to my name in the previous post. Thank you. As a mexican interpreter I suggest that, since more than 500 years have passed, maybe it is time to reconsider the role of Malinatzin in a more differentiated way and not just “label” her forever a traitor. A different perspective is given, i.e. by Laura Esquivel in her book “Malinche”. I highly recommend it. I do agree with Maria Rosa’s comment. The past is just that…past, so Malinalli or Malintzin deserves a special place in the history of interpretation. Again, we deal with living language, as spoken today. I’m not concerned with a historical judgment, just the current connotation of the «malinchista» epithet. The Mexican Colegio de interpretes de conferencia (CMIC) also awards a premio Malintzin — not just an AIIC prize at all, Ramon. Thank you for that information, Esteban. That gives me a different perspective. Hello everybody. I really appreciate the author of this information. Firstly, it is interesting to note that some of our forebears in the industry of Interpretation and Translations passed through slavery before they started this beautiful profession. Check it out! Secondly, the Mexicans should note that no matter the remotest corner of their History they have pushed this Heroine of Interpretation, her reflections would continue to be on their history. Thank you. It is time to understand that science cannot be coloured by ideologies. Julio Cesar invaded Spain, but in Spain we don’t use Cesar as an insult. Dña Marina has been a great intelligence agent, may be the best of the Spanish Army. Thank you for acknowledging Doña Marina (her prefered name), a genius woman who was sold as a slave by her step-father and remain as such until Cortés gave her “Doña” status and his name to her first child. Why would we expect her to remain loyal to her oppressors? As a Mexican woman, I am always glad to read historical revisionism regarding this mythical figure. « When law enforcement agencies do everything they can to avoid hiring a real interpreter. You are currently reading The First Interpreter in the New World. at The Professional Interpreter.